2013 TEDMED Report: What ideas could we help spread? I know I’m not supposed to say this but I’ll say it once - we’re not a death denying society. I’m starting to learn about death in nonclinical settings. My mind is opening and I’m stoked. I just returned from 2013 TEDMED where the opening salvo encouraged me to drop my palliative care persona, make intellectual and emotional connections, and ask many questions. I was then immersed in thousands of disparate ideas. Imagine my feeling when I realized that I don’t understand my patients. Patient perspectives are not seen. This problem, this theme was repeated. America Bracho, CEO and President of Latino Health Access is solving this problem by turning patients into teachers in the same community. She is creating champions in neighborhoods to teach about diabetes. These teacher/patient relationships share social and environmental denominators. The result is an empowered community. The phrase “non-compliant diabetic” is fading. What if this happened in community where someone was dying? Would it be possible if patient education was done by someone who has gone through the same experience? Would the phrase “he’s in denial” fade? I think so. I want to know. I feel that I possess listening and understanding skills but really had to take a second look when I realized that there is a whole patient vocabulary that I don’t recognize. Sally Okun, Vice President of Advocacy, Policy, and Safety at PatientsLikeMe is systematically curating a “patient lexicon”. Patients can’t be heard if patients aren’t understood. This patient lexicon will amplify voices so stories can be heard and understood. An understood story is important. Amanda Bennett, Pulitzer Prize winning journalist and author of The Cost of Hope told a poignant story of her journey with her husband through his illness and eventual death. Through their courtship and marriage they did everything; they travelled, they adventured, they had many children, they had hope. Through his cancer, they "did everything". They had hope. They had directives that clearly stated to “stop everything” when there was “no hope” but they always had hope. They did not have a narrative for death. Denial was not a bug, it was a feature. What people called denial, they called hope. Stories need to be heard. At TEDMED I was mostly an ordinary person. At lunch a CEO for a biotech company talked to me about her father’s death and how she will always remember kindness. On a trolley ride a designer explained how he is designing medical risk communication. He was interested in helping design conversations around death. At a party an EMR specialist talked about how she was moved by a home that housed the dying homeless. The topic of death is compelling because of it’s honesty. No one talked about symptoms, goals, or the normalcy of death. Just the honesty. This honesty happens amongst ordinary people. I was not surprised when meeting other physicians that death was not on conversation. Michael Hebb, chef and “underground restaurateur, impresario, provacateur” is starting a project called, Let’s Have Dinner and Talk about Death. During these dinners, they talk about the beauty, mystery, fears, and hopes and the challenges of end-of-life planning. The wonder of this is that it’s done in a comfortable dinner setting. Michael stresses that these conversations should not be with physicians, nurses, or lawyers but amongst ordinary people. People want to talk about death when coupled with the right ingredients. Michael’s project is popular, it’s artsy and it’s potentially scalable. It’s such a great idea. Perhaps the most difficult idea for me to understand is that of horizontal and vertical identity as described by Andrew Solomon, author of Far From the Tree and winner of the National Book Award. He describes horizontal identity as acquired from a peer group and vertical identify as usually respected identities from the parents. Horizontal identities are often viewed as flaws in which he describes deafness, sexuality, and severe mental illness. He heart wrenchingly describes painful ambivalence of parents between love and despair. Perhaps death is a horizontal identity that is overladen illness. Andrew proposes that as illness is moved to identity there is movement towards love and acceptance. I struggle calling death normal as I wouldn’t deafness or severe mental illness. There is no denying death, but recognizing that tension between love and despair. People long to and are so grateful when they are identified. The artist Raghava KK said, "Teach perspective, learn empathy". He has it right. I'm taking a view and saying it again - we're not a death denying society. What do you think? Is this an idea worth spreading? I'm sure some of you are surprised to see you email boxes filling up with Pallimed posts again. Since coming back from the AAHPM/HPNA Annual Assembly we have been busily working on a few projects behind the scenes as we look to the future of this website. We had a great meeting of Pallimed contributors in New Orleans during the New Orleans meeting in March. There were many fresh commitments from some of our key contributors, and you can see that both Lyle Fettig and Suzana Makowski have started writing again. The conversations sparked a energy which made all of us realize how satisfying, fun and important it is to talk about hospice and palliative medicine. We already have two new contributors this week and there are a few more in line. Fresh insight is always good, and these new writers are already bringing great ideas to the table. This is my next big project, so to really test out the new system you may see some more frequent posting as I try some options behind the scenes before it goes live. Instead of grouping blog posts all in one day, I will likely have periods where the posts come every day for a few days. There should be a lot of new features and flexibility for you the reader. One key change we all agreed on in New Orleans was to combine the three Pallimed blogs into one. The new subscription system will allow for you to personalize what content you want to see and how often. To get all the content into one blog for posterity, we will slowly be including historical posts from both sites to the main blog. All historical posts will be identified. The comments will be ported over as well but that may be a little challenging so if you see any hiccups, please share them with me. We have some other big and fun changes coming up soon, but I'll save those for another post. What's Your Vision of End of Life Care? I noticed an interesting conversation starting on Twitter last week about an illustration drawn as a part of TEDMED's great challenges. 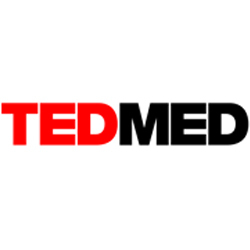 TEDMED is an annual conference dedicated to breakthrough thinking in health and medicine. While it is independent of the original TED conference which brings people together from the technology, education and design fields, TEDMED's Great Challenges Program is a series of discussions around twenty complex issues in medicine designed to engage interdisciplinary thinking and conversations. 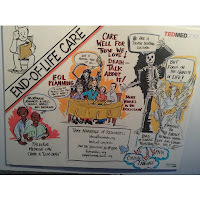 Palliative care physician, Earl Quijada attended the TEDMED conference last week and shared a photo (which can be seen below) of a sketch about some of the concepts and ideas being shared at the Great Challenges section dedicated to end-of-life care issues. This sparked an interesting conversation about what the illustration portrayed. @equijada 1. Quality of life is can be all about mortal life, it does not need to be a euphemism of an angel + energy + eternal life. #TEDMED @equijada 2. Palliative medicine is about quality of life. It can be for people with serious illness that is not "advanced." @equijada 4 While I agree we are a death denying culture, does that mean we push "talk about death" on people as a solution? @equijada 5 Do we illustrate a "normal part of life" with a scary dark skeleton looming over a family's table while they eat? @equijada 6. Can "more voices in the discussion" include groups who built the groundwork for solutions- @capcpallative, @aahpm, @hpnainfo? Advancing opportunities for early access to palliative medicine to relieve suffering and enhance quality of life for serious illness. Providing hospice and quality end of life care. Engaging the public around these related but not synonymous issues. I am hopeful that people, organizations and initiatives will utilize the incredible work that has allowed palliative medicine to become the fastest growing medical specialty in the United States and a crucial element to the future of quality and innovation in healthcare delivery. It's awesome (and appreciated!) that TEDMED is featuring a great challenge on end of life! An artist of course has free range to express their interpretation of messaging and in all honesty, while I have concerns about elements of this particular drawing, I really appreciate it because it points out an opportunity for a great discussion. I'm interested in seeing the palliative care community continue to add commentary below. What do you think of this drawing? What does it say about where we are with messaging about death? Where are we about public communications about palliative care? How can we serve as a resource to people that want to be a part of the solution and ensure advocates can access quality information? What do the following patients have in common? A 33 year old woman with post-traumatic stress disorder who has been drinking since the age of ten and develops fulminant hepatic failure. An 82 year old man ends up in the surgical intensive care unit after a self-inflicted gunshot wound three months after his wife of 60 years dies. The mother of a 55 year old woman with morbid obesity, obstructive sleep apnea, and pulmonary hypertension laments that the park nearby isn't safe for people to use. All four patients are candidates for palliative care. All of them also have potentially preventable illnesses. When I see patients like this, I sometimes ponder their plight from a six-sigma perspective. From a societal, public health, and healthcare system standpoint, what were the six missed opportunities which could have helped ensure that the patient before me stood a chance to avoid their illness? ** The healthcare system brings it's resources to bear too late. Is the patient with lung cancer a candidate for a tyrosine-kinase inhibitor? What are the benefits of pentoxifylline for the second patient? Should the third patient receive mannitol? Is the last patient a candidate for sildenafil? While not unimportant questions, at times it feels like rearranging the deck chairs on the Titanic. From day one of medical school, I had some sense of the importance of preventative medicine, but nothing has emboldened my advocacy for prevention more than my chosen career in palliative medicine. Palliation and prevention aren't mutually exclusive, either. The patient with advanced lung disease who still smokes may have the goal of living long enough to make it to his son's wedding or to stay out of the hospital as much as possible. Thoughtful discussion of prognosis and disease trajectory may motivate him to finally move from the contemplation or preparation phase to the action phase of smoking cessation. The palliative provider can play a vital role in this type of tertiary prevention, even if it's just answering the question, "Why should I even bother at this point?" In some circumstances, prevention of disease may be impossible for the patient. The woman who lies comatose in the ICU after an intracerebral bleed may no longer benefit from blood pressure management. When the patient's son asks the question (with his own children present), "should we be concerned about our risk for something similar happening?" it should be recognized as a teachable moment. April 16 is National Healthcare Decisions Day (NHDD). Advance care planning represents one important intersection between prevention and palliation. In serious illness, conversations between patients and physicians about the end-of-life correlate with several positive outcomes for patients and bereaved loved ones. While the conversations in this study occurred only months before death, this fits the mold of prevention: Taking action now to provide benefit later. You may not have a serious illness. Your death probably isn't imminent. But catastrophic trauma or illness is still possible. You may not be able to speak fully to your wishes for or against specific interventions. You can still consider what you would value most if faced with a serious illness. More importantly, it's not too early to talk about it with your loved ones, especially the ones who would speak for you if you cannot speak for yourself. The NHDD site provides several helpful resources to facilitate this type of conversation as well as meaningful documentation. "I have an advance directive, not because I have a serious illness, but because I have a family." When I meet with the family of a patient who cannot speak, I see it as my job to help families sort through the maze of options and align treatments with the patient's values. While this can be accomplished without any previous advance care planning, it's easier on all sides of the table if there has been open consideration of related topics by the patient before the illness. In a society that values autonomy and the right to self-determination, there's a palpable loss when the person under discussion doesn't have a voice. Advance care planning helps to mitigate this loss and brings your voice back to the table when you cannot speak. Like the patients at the beginning of this essay, I start to think of missed opportunities when advance care planning hasn't occurred. *Any resemblance to actual patients is purely coincidental, although I'm sure there will be resemblances. These scenarios are common, unfortunately. **Not addressed here are issues of hereditary predisposition, personal responsibility, bad luck, or other causes which may be outside of our control. The New England Journal of Medicine released an article this week on the experience of implementing a Death with Dignity program in Washington at a University based Cancer Center. In the Fall of 2008, the voters of Washington State passed the Death with Dignity act allowing for the legal practice of prescribing medications for the self-administration by a person with a terminal illness with the goal of ending their life. This can be described using a variety of briefer terms: physician-assisted suicide, physician-assisted death, medically hastened death and others. (For the record it is not technically euthanasia since that describes an act where a health care professional adminsters medication. And that is illegal in the United States.) In the NEJM article the authors refer use the term physician-assisted death, likely because it has been utilized as the most descriptive term that remains value neutral in regards to the presumed psychological pathology of an act of suicide. This is an important article because it describes how this center went about actually implementing the Death with Dignity program including the following challenges: were their enough doctors to actually prescribe the barbiturates? How would patients know about this programs availability given that is what a legally accessible medical option? Do you put fliers in the waiting room? What if the attending refuses to participate? To really understand how they approached this I strongly recommend you read the article regardless of your feelings for or against physician-assisted death. With this issue coming up repeatedly on state ballots over the past decade, it could very be legal in your state sometime in the next several years and you may find yourself and your fellow staff grappling with these same difficult questions. It is limited in that they only served patietns with cancer, and it would be interesting to see how patients with non-cancer terminal diagnosis were handled at this institution. As has been seen in other reports on why people choose physician-assisted death, the main reasons were loss of autonomy, loss of enjoyable activities, and the loss of dignity. The center reports that feedback was all generally postiive. One important piece of data that many people will wonder about is how many deaths are tied to physician-assisted death and is that number changing from year to year. You can always check the Oregon and Washington Department of Health websites as they are mandated to report this data on a yearly basis. In 2012, Oregon had 115 prescriptions with 77 deaths related to Death with Dignity. In 2011 (the last year reported), Washington state had 103 participants and 70 deaths. The NEJM has also developed a case around physician-assisted death, but curiously they refer to it as physician-assisted suicide (PAS) differently than the authors of the article. At the end of the case you have the opportunity to give your opinion about whether PAS should be permitted. As of the publishing of this post there are 275 responses with 54% against PAS and 45% in favor of allowing PAS. I would encourage you to take the poll and post your opinion on NEJM, but also to share your responses here with our poll as well. (Feel free to copy your opinion from the NEJM poll and post it here) Our Pallimed poll asks for no identifying information. Results will be shared here in aggregate with some commentary. Make sure to check the supplemental materials for the NEJM article if you do have a subscription or library access as they actually include the policy from the hospital. End of Life in the News: Where are all the Palliative Care Teams? By now, many of you may have heard or read Charles Ornstein,(@charlesornstein) a Pulitzer Prize-winning senior reporter, on NPR or in ProPublica on "How Mom’s Death Changed My Thinking About End-of-Life Care." He tells of his mother's final days in the hospital, after having aspirated during the placement of a naso-gastric tube that resulted in cardio-pulmonary arrest and subsequent days in the ICU. He speaks to the sense of being alone and the lack of guidance in the process of end-of-life decision-making. My heart dropped when hearing this story - for his (and his family's) loss, the difficulty of the process so clearly expressed, and for the haunting silence and void of palliative care throughout the care and in his stories. During the interview with Jorge Valencia from The Story, Mr. Ornstein outlined his wish to have had "someone that was not involved in this case at all to come in and offer a perspective." He did not want his decision to be rushed. He expresses how his experience changed his view of end-of-life care - heightening his awareness of how the media and politicians have "allowed societal slogans to prevent us from having sophisticated conversations about end-of-life care" and as a result have left families without any sense of support. Mr. Ornstein reached out to an author of the Dartmouth Atlas (a family physician and researcher), to other experts in neurology, and to literature on the web for guidance and reasurrance, but the story didn't mention working with a palliative medicine clinician. Perhaps he did not meet with a palliative medicine clinician because of lack of access, or perhaps because of the mis-perception of our field. Perhaps he, like many others, did not realize in addition to being experts on alleviating pain and suffering, on caring for patients who are living with long-term life-threatening illnesses like cancer and dementia, we also are experts in helping navigate difficult questions about prognosis, medical decision-making - and especially in situations like these - not merely the questions of "whether to get another round of chemo, or to keep someone alive by putting a feeding tube int heir stomach or a tracheostomy as they're progressing to their death." It is in the grey areas that the specialist is called in, when the decisions are not clear, when the discussion is harder. There is a lot of discussion amongst the leaders and board members of AAHPM, HPNA, and NHPCO about the need to work with the media to make better known what our role can be, to change our public image. Indeed, we have our work cut out for us. We are taking steps to increase understanding of our specialty - we have a patient website, www.palliativedoctors.org, we created a youtube video speaking to situation Mr. Ornstein writes, we tweet ferociously, and even our board's President, Amy Abernathy is planning to speak at this year's TEDMED, but we have a lot more to do. If the President of the Board of the Association of Health Care Journalists, who has written extensively on the US healthcare system and end-of-life care, is unfamiliar with palliative care as a specialty in medicine, nursing, and social work that could have intervened and offered the unbiased guidance in medical decision-making, as well as helping support patient and family to address the trauma and grief of their experience, then surely others without his professional interest who face similar healthcare situations would not know to turn to us. I agree with Mr. Ornstein: we need help from our politicians and from CMS leadership to recognize the both the work and value of having the conversation, as well as the expertise it takes when done well to assure families the guidance, support, and non-abandonment they deserve when facing the toughest of decisions - how to care for patients at the end of life, especially when it is unclear how near that end truly is. I encourage us to take Mr. Ornstein up on his request to expand the dialogue with healthcare reporters about end-of-life care and to answer Mr. Valencia's question on how to "make this conversation more public and less lonely." Lastly, I can't help but think how different his story might have been had palliative care been part of his mother's and family's care during those days in the ICU. We may not have changed the outcome or the weight of grief, but I am certain palliative care could have offered another perspective, to listen, to lend strength, and to assure the family would not have felt so alone. It's the first week of April, and we're on the verge of the penultimate games of the NCAA Basketball Tournaments. Since only four teams remain, chances are good that your favorite team is out of the tournament. As someone who has experienced that feeling 25 times over the years (but who's really counting? ), I offer my condolences. To the few who still have a team in the tourney, condolences are pending for 75% of you. In honor of March Madness, I offer a challenge. Watch the video below and follow the narrator's instructions to count the number of times the team with the white shirts passes the ball. In medicine, the team with the white shirts passing the ball back and forth represents many of the activities of medicine. Look at all the energy which goes into deciding on the best chemotherapy regimen, the optimal time to extubate, whether to proceed with a coronary artery bypass graft or manage medically, or to get a PET scan to rule out metastases before operating. Also, it represents titrating analgesics to reach the patient's goal for pain control, discussing code status, talking about the last game to establish rapport, and educating about the benefits of hospice. Medical school taught us well how to watch the team wearing the white shirts. There's so much happening in the video of medicine, it's easy to miss the suffering of the patient and their loved ones. In his classic treatise, "The Nature of Suffering and the Goals of Medicine," Eric Cassell defined suffering as a threat to the integrity of personhood. One should not equate this with a horrible symptom: The pain of natural childbirth is typically excruciating yet transient and soon eclipsed by the joy of the newborn child. Cancer pain which is now controlled by morphine may still "cause" suffering if the person fears the inability to fulfill one of their central roles in life. What if the pain comes back and I'm unable to make it through my son's graduation? What if the response to cisplatin/etoposide isn't durable? How long will it be before the other shoe drops? Unique to the individual and potentially isolating, one person may struggle with these questions given a particular illness or symptom while another person may struggle with an entirely different set of questions. We maintain hope that by keeping our eyes on the ball, maybe the questions will stop appearing. When faced with a serious, incurable illness, if a question fades you can count on another to appear, all the way through the loved ones' grieving process and beyond. We have shockingly little control over this fact. I take pride in my expertise at watching the guys in the white shirts pass the ball around. This pride led to slight embarrassment when I watched the video at an AAHPM pre-conference conducted by Epstein and Back entitled, "Witnessing Suffering: An Introduction to Mindful Practice and Mindful Communication." I say embarrassment, because admittedly I found myself just as surprised at the end of the video as when I saw the video the first time about a year ago. What to do with suffering we may not be able to "fix"? First, learn to recognize it. You don't stand a chance to fix something that you haven't diagnosed. Second, pay attention so you don't miss it. Here's where things get more complicated. You are still responsible for keeping your eyes on the ball. One might argue that suffering should be "the ball." You won't find any argument here, but the rest of it is still there. Mindfulness, or the practice of bringing one’s complete attention to the present experience on a moment-to-moment basis, may help you with all the layers present, some which may opacify the lens through which suffering may be found. If this isn't something you've considered before, you can start by thinking of the this as an exercise in efficiency. Where there is suffering, you will likely find what is most important to your patient at that moment and from there, decide how much focus to place on everything else. Which of your many potential actions will maximally reduced the suffering? You will find yourself closer to the heart of patient-centered goals of care. Sometimes, there are no balls, no players- nothing which can be "fixed" and only a patient, a physician, and suffering. In this moment, you cannot fulfill the task of fixing problems which society assigns to physicians and we to ourselves. In our own isolation, we can be mindful of it in the present moment, be aware of the feeling of inadequacy, increase our focus on the person sitting in front of us and thus offer hope of reducing that person's isolation. Need research regarding the benefits of mindfulness to the clinician? Here's just one study. It demonstrated that primary care physician participation in a mindful communication program was associated with short-term and sustained improvements in well-being and attitudes associated with patient-centered care. Have I piqued your curiosity with this brief introduction? Ample information about mindfulness exists on the internet. Epstein and Back pointed to an intriguing four day workshop as an opportunity for clinicians who face serious illness and mortality in their practice to learn more about the topic. When death is near, and no cure is available, more and more patients are turning to hospice to meet their end-of-life needs. To meet those needs, more and more hospice agencies are building hospice homes. These state-of-the-art facilities provide a place for patients to spend their final days, away from the commotion of the hospital or the dreariness of the nursing home. A hospice home is a free-standing facility designed to provide a private and comfortable setting where patients can die peacefully, often surrounded by friends and family. Yet many hospice homes are finding that privacy can be difficult to maintain, especially in the final hours. One hospice agency plans to put a stop to inadvertent intrusions in the final moments of life. Happy Endings Hospice, one of Fisherville's leading hospice providers, recently opened their hospice home in nearby Grim. 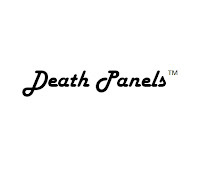 The agency incorporated an innovative feature: Death Panels™. “We originally wanted to make signs to hang on the door, but that seemed too gauche,” said Cecil E. Saunders, chief engineer for the project. “Then someone on our design team had the bright idea to add floor-to-ceiling sliding blinds in each room.” The large panels, tucked away in the wall, easily slide on tracks built into the ceiling, and create instant privacy. As the patient’s final moments approach, the panels encircle the bed, allowing family and friends to say goodbye in an intimate and secluded space. The Death Panels™ also send a clear message. 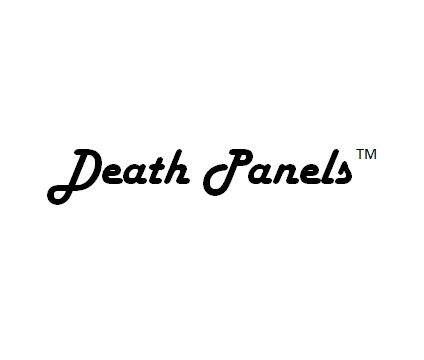 While Death Panels™ have been well received by most, they are not without controversy. Former Alaska Governor Sarah Palin created a national stir when she complained that the new Affordable Care Act would mandate the establishment of death panels. “I’ve read through the entire law, and I just can’t find it in there,” says Angela Harp, director for policy at Happy Endings. “I don’t understand the big deal. I mean, they’re just big slabs of wood that slide around. Quite frankly, I wish Death Panels™ were covered, because those things were expensive.” Cost aside, Angela is hoping that other hospices turn to Death Panels™ as a means to ensure that patients’ end-of-life wishes are honored. “If you or a loved one is comparing hospice agencies,” says Angela, “ask them if they use Death Panels™.” You may be surprised by the answer.